Mattress Pad, Protector or Topper: Which Is the Best? Pad, Protector, Topper: Which Is the Best for Your Mattress? Can You Use a Mattress Pad, Protector and Topper Together? Which Is the Best: Mattress Pad, Protector or Topper? Are you happy with your bedroom setup? If your bed isn’t quite perfect, but you don’t have the budget to buy a brand new mattress, one or more affordable bedding accessories may enhance your mattress experience. What kind of accessories are we talking about here? 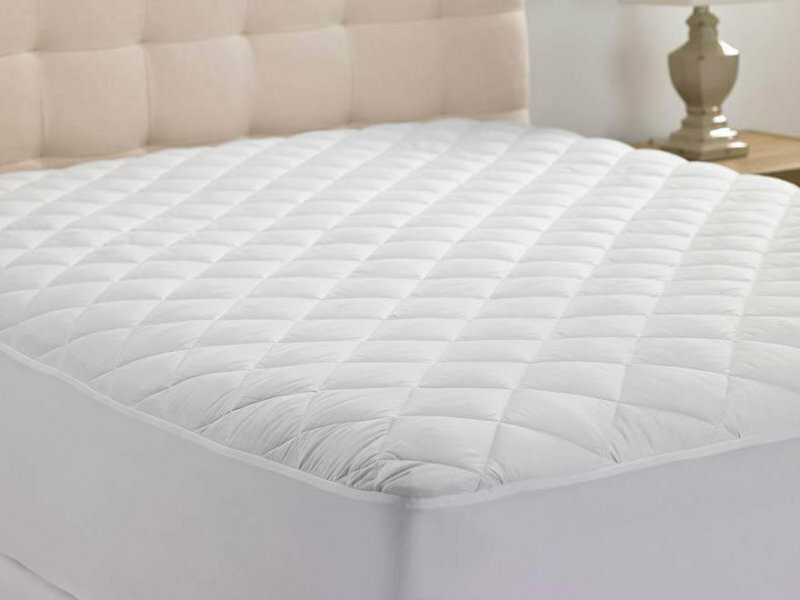 In this article, we focus on the most common options: the mattress pad, the mattress protector, and the mattress topper. What’s the difference between a mattress pad and a mattress topper? How do you know if you need one or the other? What about mattress protectors? Why should you use any of these? We know—it can be overwhelming. Don’t worry! We’re here to help. Having a good night’s rest shouldn’t be hard, so let’s make things easier for you. Below is all you need to know about pads, protectors and toppers for your mattress. It is a thin and usually quilted layer of material placed over the mattress but under the sheets. A mattress pad is often similar in design to a fitted sheet—the difference being that the part which goes over the sleeping surface is more plush than the side panels. Some models may use corner straps instead, but these are not as common. What Does A Mattress Pad Do? A good mattress pad will keep bed sheets in place and fitted properly. It can also provide an extra layer of softness and comfort, as well as added protection against stains or spills. The real goal of using this bed accessory is to extend the lifetime of the mattress without dramatically altering the way your bed feels. While it does add some plushness on top, it’s usually not enough to really make a long term difference in comfort level. Most mattress pads are breathable and machine washable, but there are some exceptions. Some variants are water resistant or outright waterproof. Some specifically guard against dust mites and bed bugs. Some are even powered by electricity to provide temperature control. Why Should You Use A Mattress Pad? We’ve already mentioned the main reason above, but keep in mind that there are many other instances where a mattress pad would come in handy. It’s not just an accessory for brand new mattresses! You’re set to sleep on a used or a secondhand mattress and would like a hygienic extra barrier in place for peace of mind. Beds in dorm rooms and hostels are likely candidates. Your waterproof mattress protector makes squeaky noises that may be muffled by soft material over it. You sleep hot and sweat excessively in bed. A breathable mattress pad will absorb the sweat before it stains the mattress and won’t disrupt the airflow that is crucial for heat dissipation. You occasionally co-sleep with pets and/or small children. A baseline mattress pad will keep dander, dirt and odors from sticking to the bed itself; and a waterproof one will make cleanups after accidents much easier. Where Can You Buy A Mattress Pad? Most bedding stores and large online retailers will carry mattress pads. Expect the price point to be anywhere from around $20 to around $60, depending on mattress size and mattress pad type. Below are some of our baseline mattress pad favorites. All of them are very affordable at under $25 each for a queen size. Utopia Bedding Fitted Quilted Mattress Pad (Check deal on Amazon). This polyester and fiberfill product is soft, breathable and machine washable. You can even tumble dry! The knitted skirt around the mattress pad surface stretches and can accommodate mattresses up to 16 inches thick. Hanna Kay Extra-Deep Quilted Mattress Pad (Check deal on Amazon). Using a poly-cotton blend and more filling than other similarly priced models, this mattress pad is also hypoallergenic and very versatile—no special washing instructions included! The best part: Hanna Kay’s 10-year “Shield It” guarantee, which comes with the promise of a no questions asked refund. The Grand Fitted Quilted Mattress Pad (Check deal on Amazon). This cotton and polyester product is very similar to the two mattress pads above, except for one thing: It can stretch to fit mattresses up to 18 inches thick. Wanting something more luxurious, but not at luxury prices? Check our Luxor Linens Francisco Mattress Pad review! It is a relatively thick layer of material that is placed on top of the mattress in order to increase bed comfort and/or support. Like a mattress pad, it should absolutely be under the fitted sheet. But unlike a mattress pad, it’s rarely washable—though a mattress topper may sometimes come with a removable cover that you can clean. It rarely comes with a fitted skirt design, and more often comes with corner straps to secure it in place. A mattress topper—sometimes called a mattress enhancer—can be anywhere from one to three inches thick, or even thicker, depending on the model. It can be made from many different types of foam: gel memory foam, latex foam, memory foam, or poly foam. It can also be made of very thick quilted material that can include cotton, down, or polyester fiberfill. Think of a mattress topper as an evolved mattress pad: stronger and thicker, but both designed to make your mattress experience better. More than protecting the mattress, a mattress topper is meant to adjust how your bed feels when you sleep on it. With the right one, you can adjust the firmness and support of your bed to perfectly match your preferences. This is why there are two main kinds of mattress toppers: foam and quilting. The former usually makes your bed feel firmer, while the latter makes your bed feel softer. Latex foam toppers are ideal for adding firmness and a little bit of bounce. Memory foam toppers are great for added pressure relief, and gel memory foam toppers provide the additional advantage of cooling. Quilted toppers—sometimes called fiberbeds and featherbeds—can provide a softer and plusher feel, along with extra warmth. Why Should You Use A Mattress Topper? A mattress topper is not as affordable as a mattress pad, but not as expensive as a new mattress. If you’re not completely satisfied by how your mattress feels, you can make small changes by using the proper topper. Your mattress is old and needs replacing, but you can’t afford a new mattress yet. A topper can be a cost-effective way to lengthen the lifespan of your old mattress without sacrificing your comfort. Your mattress is new, uncomfortable, and can’t be returned. This should be a very rare occurrence, as most mattress companies offers lengthy sleep trials. But should you find yourself in this situation, a mattress topper is an elegant solution. You need a softer or firmer sleeping surface for a temporary condition. You could be dealing with an injury or going through a pregnancy. A mattress topper can make you more comfortable without stretching your budget. Where Can You Buy A Mattress Topper? Mattress toppers are just as easy to find as mattress pads and protectors, but they are considerably more expensive. You may want to go to a brick and mortar store to make sure you buy exactly what you want, but of course online retailers will be more convenient and will likely offer a bigger selection. Ultimate Dreams Talalay Latex Mattress Topper (Check deal on Amazon). Completely covered in natural bamboo fabric and comprised of Talalay latex foam inside, this is one pricey but truly luxurious mattress topper. It comes in three firmness levels, too: soft, medium and firm. Best for pressure relief and for heat- and allergen-sensitive skin. 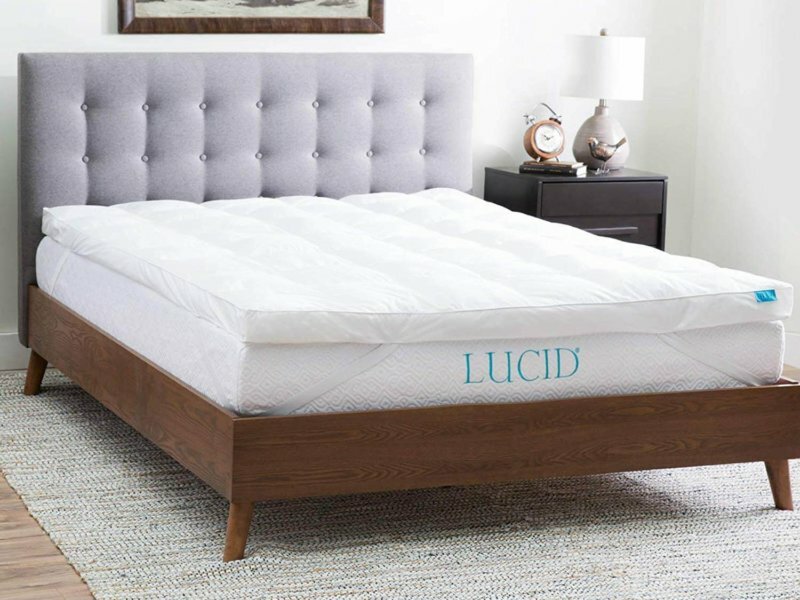 LUCID Fiber Bed Topper (Check deal on Amazon). This affordable alternative fiber topper offers the comfort of down without the allergens and odors. 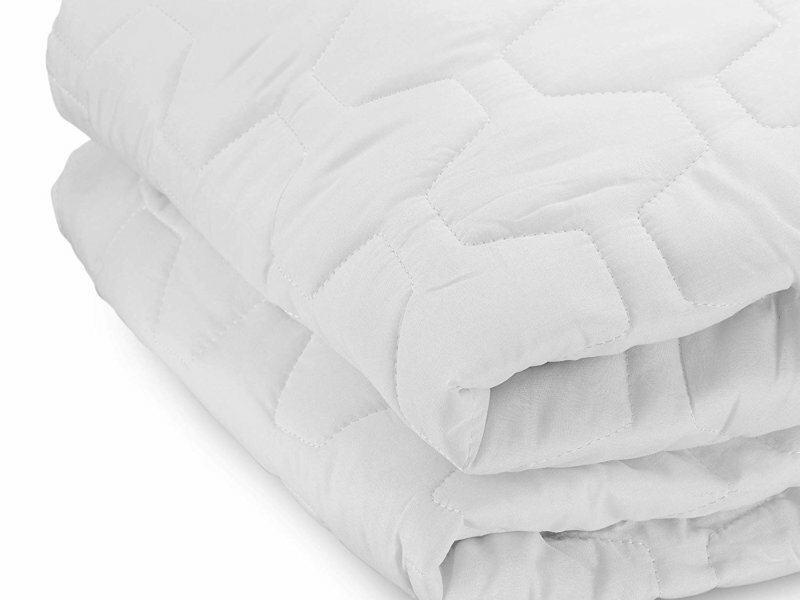 Breathable and soft with a 250-count cotton fabric cover, the quilted stitching also guards against clumping and shifting. On top of this, the mattress topper comes with a 3-year warranty. Sleep Innovations Dual Layer Mattress Topper (Check deal on Amazon). 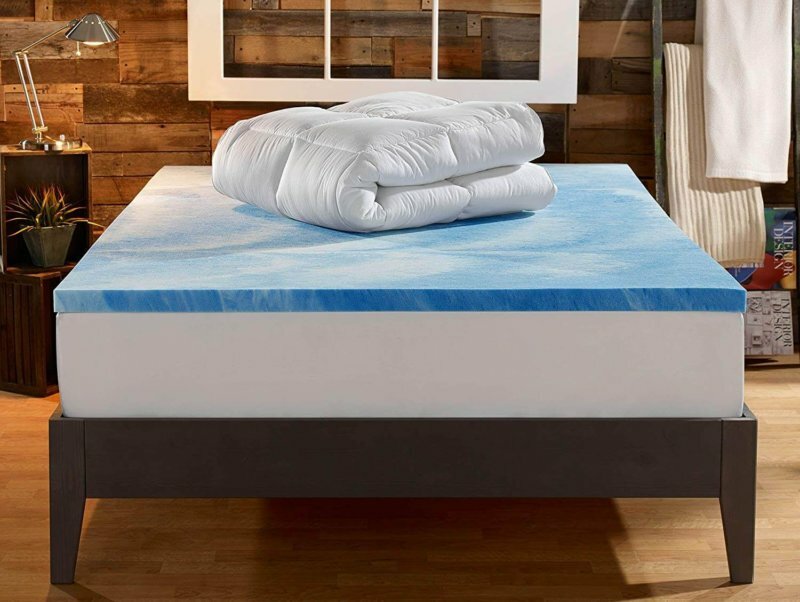 With a price point in between the Ultimate Dreams topper and the LUCID topper, this 4-inch thick Sleep Innovations product offers the best value, too. It comes with a machine washable cover that encases a two inches of quilted fiberfill on top of two inches of gel memory foam. Sleep Innovations also offers a 10-year limited warranty. It is a thin sheet of material designed to completely cover all exposed parts of the mattress. Some protectors are designed to go over the mattress like a fitted sheet, with elastic at the edges to secure it in place. Others are zip removable, like mattress or cushion covers. While the vast majority of mattress protectors are cotton, polyester or a blend of the two, you can find some made out of other materials. In particular, some waterproof variants may be made of vinyl. It’s in the name. This bed accessory’s main purpose is to act as a shield to guard a mattress against contaminants like allergens, bacteria, dirt, fungi, pests, spilled liquids, and others. If you’re especially worried about dust mites or bed bugs, zippered models—sometimes called mattress encasements—may be what you need. A word of caution, though: Some waterproof or otherwise heavy duty mattress protectors may affect the heat regulation and breathability of your mattress. Think of the mattress protector as the mattress pad’s very serious cousin. It’s all business, and rarely about comfort. Why Should You Use A Mattress Protector? Out of all the bed accessories we’ve included in this article, the mattress protector stands out as a true bedroom essential. It is cost-efficient, easy to use and maintain, and entirely beneficial to use. You worry about bed bugs. Bed bugs are on the rise due to an increase in domestic and international travelling, among other things. Should they happen to make your way to your home, a good mattress protector will keep you bed out of harm’s way. You have children and/or pets. No judgement—just plain common sense. Taking care of children and pets can get messy and tiring. A mattress protector, especially a waterproof one, can make things easier on you. You live in a dusty or moisture-rich environment. You can’t wash or replace your mattress easily—but you can do both to a mattress protector. And even if you can control the amount of dirt and dust your mattress is exposed to, humidity isn’t so easy to manage. Remember that moisture buildup in your mattress could lead to mold. Yikes! Where Can You Buy A Mattress Protector? You can find a mattress protector anywhere you can buy bed sheets, for the most part. Many mattress companies—like Casper, Eight or Purple—include mattress protectors in their respective product lines, as well. LINENSPA Mattress Encasement (Check deal on Amazon). This six-sided, full encasement protector is made from breathable, lightweight and vinyl-free fabric. Best for allergen, bed bugs, and dust worries! It fits mattresses up to 12 inches thick and comes with a 10-year warranty. 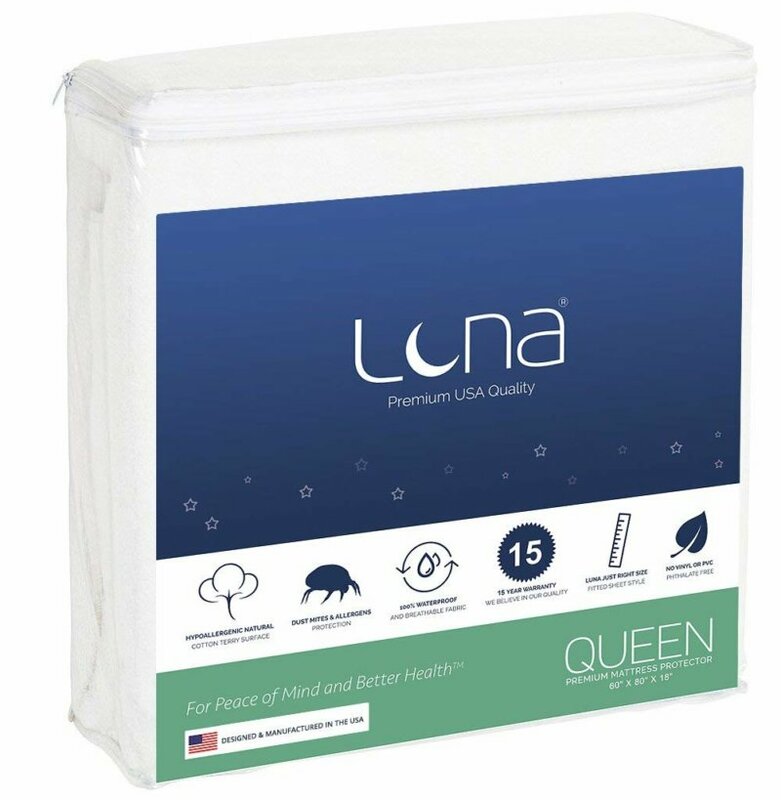 Luna Premium Mattress Protector (Check deal on Amazon). Though this protector isn’t six-sided, its fitted sheet design does allow it to be used with mattresses up to 18 inches thick. The cotton terry surface is absorbent, breathable, hypoallergenic and noiseless; and comes with a 100% waterproof underside. The best part: Luna’s 15-year warranty. 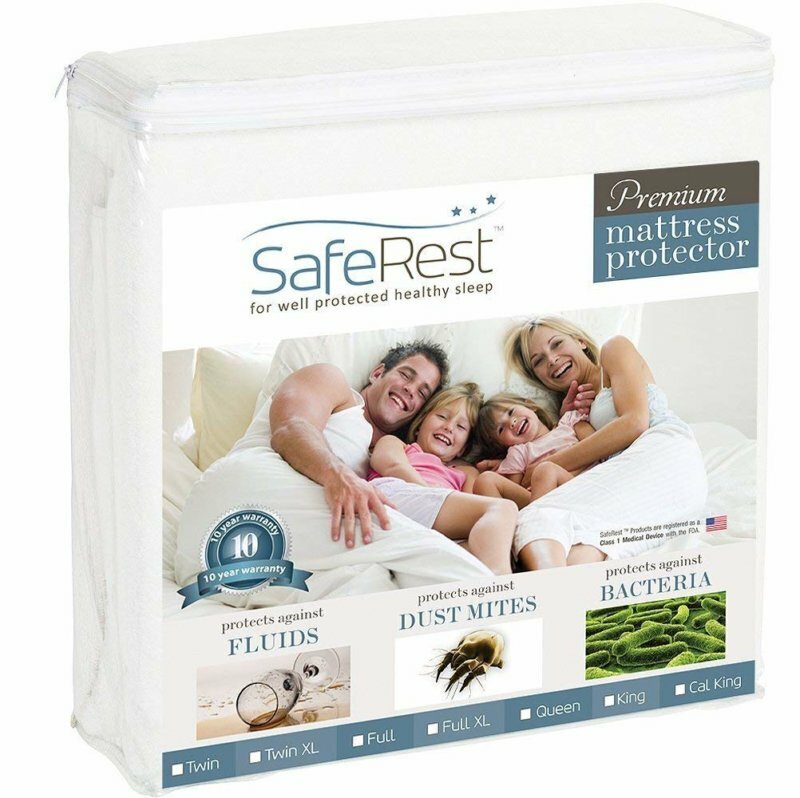 SafeRest Premium Mattress Protector (Check deal on Amazon). This protector is very similar to the Luna mattress protector, except for two things: It is a Class 1 medical device registered with the FDA, and SafeRest offers a shorter warranty—10 years. Of course you can. Is it a good idea? That’s all up to you and your preferences. Proper temperature regulation so you don’t sleep too hot or too cold. Do You Need a Mattress Pad If You Have a Mattress Topper? It is not essential, but a fitted mattress pad can help keep a mattress topper securely in place. It can also protect the mattress topper from stains and spills, should the topper not come with a removable cover. A mattress topper does more to change the feel of your bed than any mattress pad ever will. In most cases, a mattress pad will be redundant—especially if you’re also using a mattress protector. However, a mattress pad may still add a small measure of softness to your sleeping surface. Do Mattress Pad and Topper Go Under the Mattress Protector? Usually. The typical setup is mattress, then mattress topper, then mattress pad, then mattress protector, then fitted sheet. You may customize your setup, of course. For example, if your mattress protector is the full encasement kind, you may want to place your mattress pad right underneath your fitted sheet for easier access. After all, a mattress pad is supposed to be washed regularly. Every sleeper is different, as much as every bed is different. There’s no clear and universal answer here! In the bedroom, we are all Goldilocks—searching for the bed that’s just right. This is why mattress pads, protectors and toppers exist. Here’s the truth: Assuming you have a great mattress that you love, there’s little a mattress topper can do. This bed accessory is for mattresses that fall into the too hard or too soft categories. That leaves the mattress pad and the mattress protector. If we had to choose only one, we would go for a mattress protector. It has one job, and the right one will do it well. However, we do concede that a mattress pad is usually the more affordable, portable and best value choice. It adds some plush and some protection, and it’s very easy to maintain.